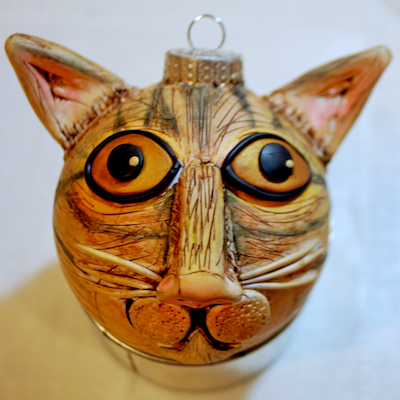 Now that I’ve completed the Languedoc-Roussillon series, I must move on to the next task on my list: Holiday ornaments. 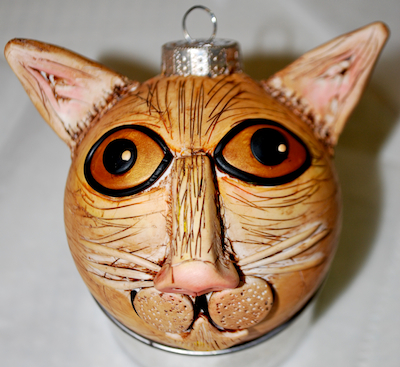 I need to make several for NOA for their upcoming holiday season display (which sounds really nice; 5 white Christmas trees displayed in both stores & decorated entirely with local artisan-made ornaments.) 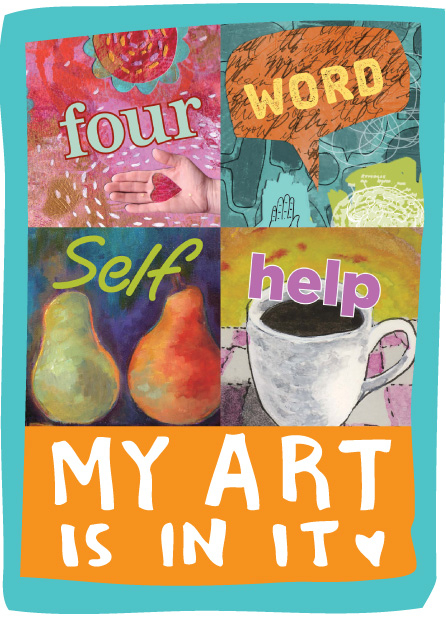 And there are the upcoming shows on my schedule (Merrimack Valley Artisans, Bolton Artisans Guild, ArtSpace-Maynard.) Time to GET BUSY! 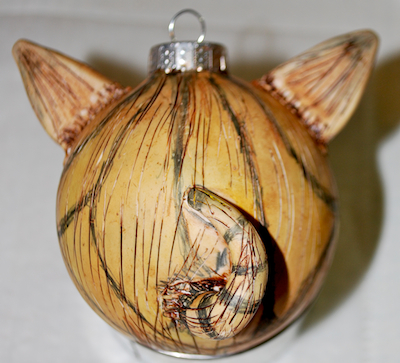 This year I decided to try sculpting over a round ornament. That comes with a different set of challenges as the shape can change the perspective. I wanted to make a prototype piece first. This one is the practice piece and takes all the grief. 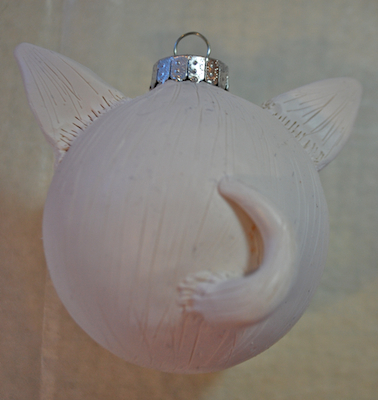 Poor ornament. Here is my process for this cat prototype. 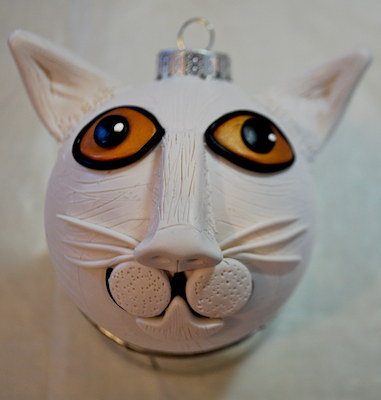 I started with white polymer clay, covered the glass ball and added facial features. I really struggled with the face. That could be because I haven’t sculpted in a while and was shifting gears from the encaustic work back to polymer clay. 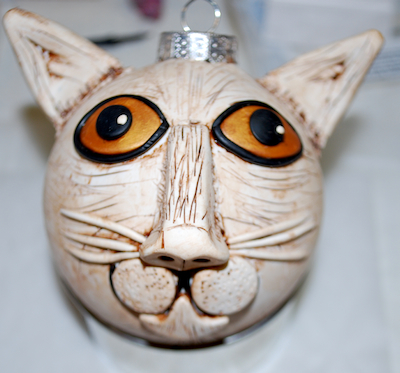 After proto-cat was cured and cooled, I added an antique wash of acrylic paint. Not bad. Now you can see the texture I added with a needle tool. Next up is adding more color. This year I’m experimenting with oil paints and coloring the clay. So I rubbed, smooshed, and then wiped off several oil paints to give proto-cat some color. Well now he’s glowing. It takes a little trial and error when applying the oil paint. Be sure to wear gloves! At this point I’m not really happy with the results. 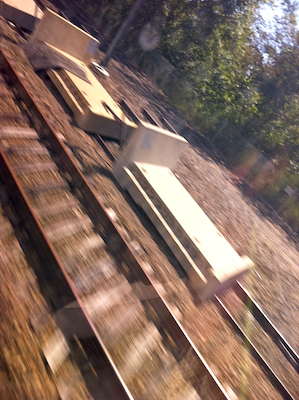 What I see in front of me isn’t matching what is in my head…or my model/inspiration for that matter. Taking a clue from my model (who is sleeping on the studio floor), I take a break and come back to the ornament in the evening. I add some more oil paint and additional color with Prismacolor pencils. This adds some depth and definition. And a back view. 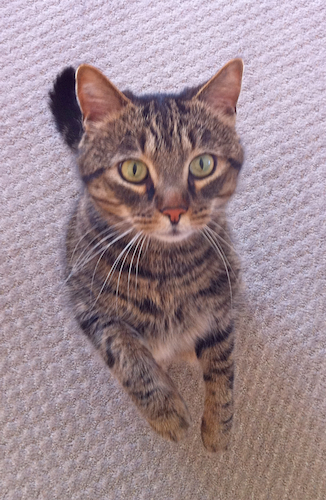 I think I like his tail the best…. Sigh. I’m still not feeling the love here. Proto-cat looks a little alien to me. But that is why this is a prototype. 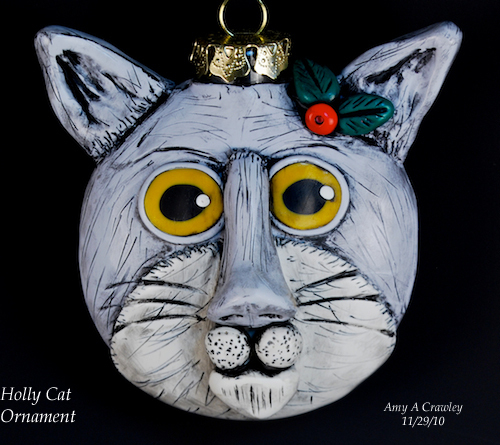 Categories: Amy's Art, Creativity, Polymer Clay, Sculpture, Style | Tags: Cats, Creativity, holiday ornaments, Polymer clay, Sculpture | Permalink. Over the past several weeks, I have been working on a new series of artwork, Snapshots and Memories from Languedoc-Roussillon. 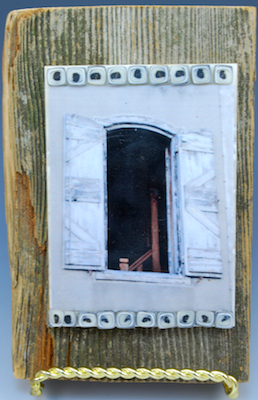 This series of artwork was inspired by a trip to an area of France known as the Languedoc-Rousillon region. The Languedoc-Roussillon region is a loosely formed triangle that includes such towns as Albi, Revel, and Toulouse. It is an area steeped in history, with many castles and ruins from the time of the Cathars. It is a magical place. This series currently features 15 collectible pieces. 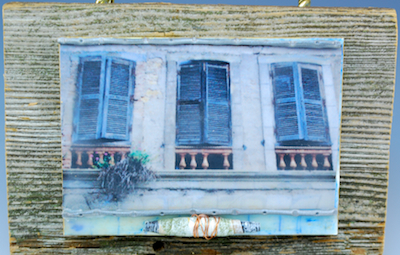 All of these pieces are created using encaustic medium. Many feature the fusion of polymer-encaustic. 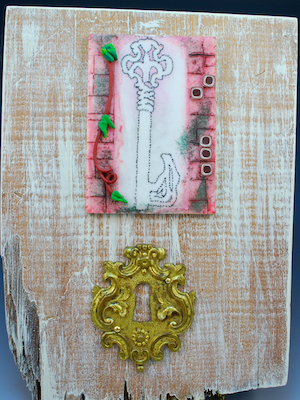 That is, the combining of encaustic medium and polymer clay. 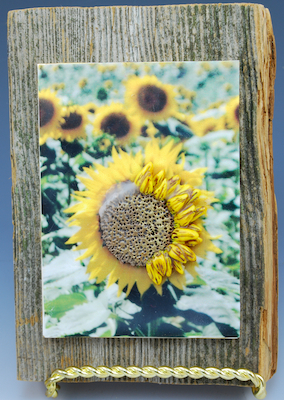 All of the pieces feature my printmaking or my original photographs. 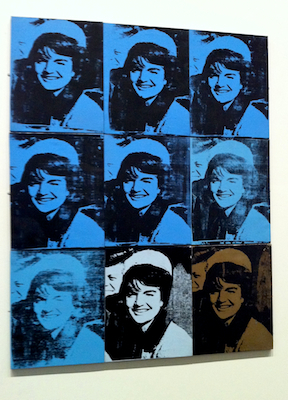 Each image is fused to a board the size of a playing card (2.5″W x 3.5″L). 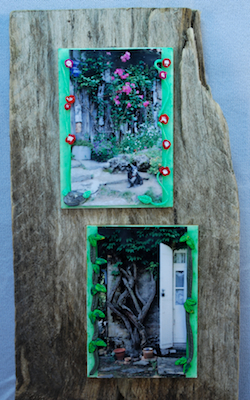 The playing card size board is then mounted onto wood. 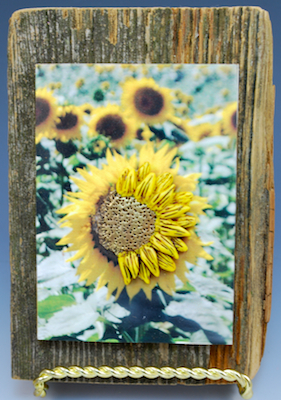 Some of the images are presented individually on the wood boards. 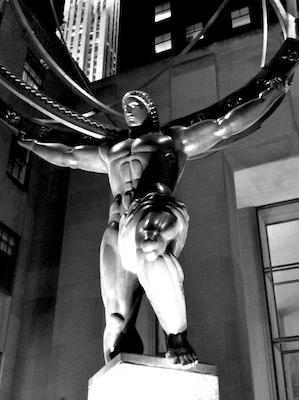 Other images were combined in double and triple formats. Several of the pieces are additionally embellished with items I purchased at the local Vide Grenier (flea market) during my time in France. All of the artwork is ready to hang. 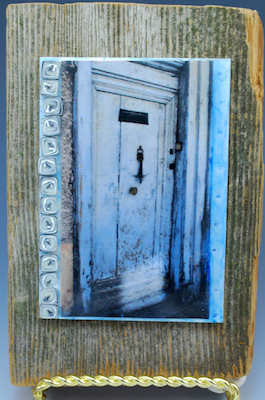 Categories: Amy's Art, Inspiration, Mixed Media, Polymer Clay | Tags: Creativity, encaustic, France, Inspiration, Mixed Media, Polymer clay | Permalink. but preparing to work can take any length of time. 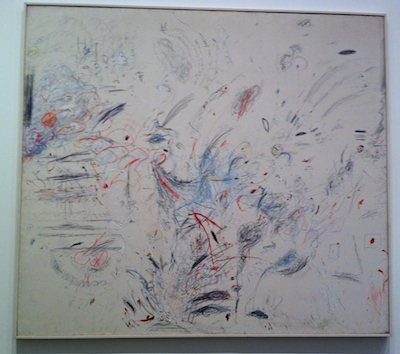 Categories: intention, Philosophy, Quotes | Tags: Cy Twombly, goals, intent, philosophy, Quotes, time, work | Permalink. 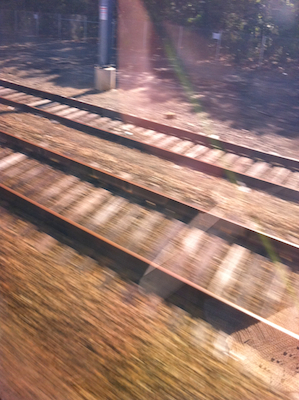 We took the train for our recent trip to New York. To me it is much less stressful than flying into JFK or Laguardia. No one asks me to take off my shoes. I can choose from an assortment of food to eat. The legroom is better. And they have wireless onboard. 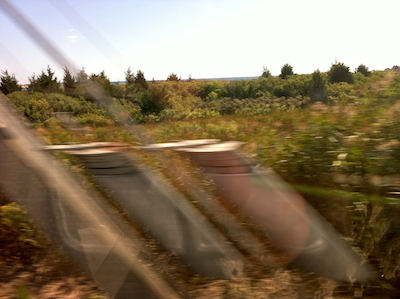 I was a little bored on the trip home so I decided to aim my camera out the window and take random pictures. 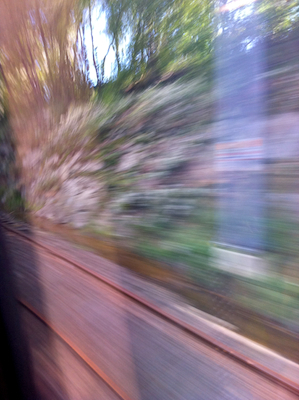 Some turned out quite nice…and in focus. These, however, I found a bit more interesting. 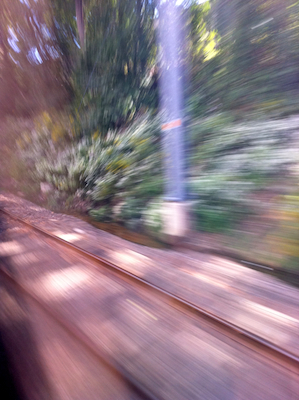 They captured the blur as we passed by. I’m preparing for an Open Studio event this weekend. 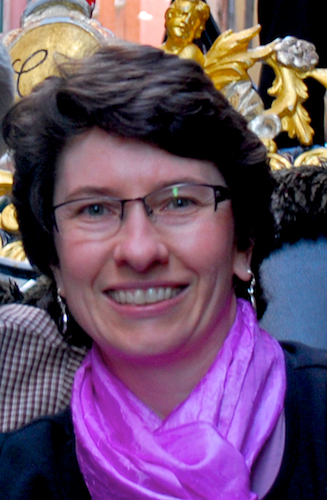 I’ll share pictures of my newest series, Snapshots and Memories from Languedoc-Roussillon, next week. 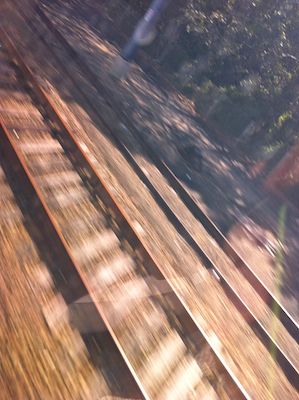 Categories: Environment, Nature, Vacation | Tags: Amtrak, life, Nature, New York, speed, trains, Vacation | Permalink. 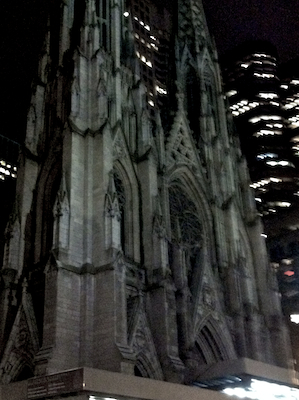 We got away for a long weekend to New York this past weekend. An early anniversary trip. Over three days we walked almost 30 miles. Those 30 miles included two museum visits, a trip to ground zero, and walking through part of Central Park and Times Square. All that walking and I still gained weight. Darn those cupcakes! 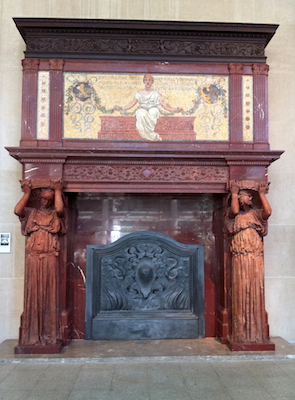 Below are some shots from our trip, most from the Metropolitan Museum of Art. It was our first visit to the Met. After a few hours we were definitely on art overload. 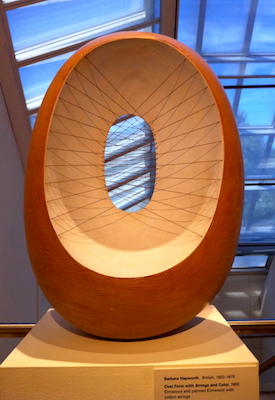 I was not familiar with Barbara Hepworth’s artwork. You can read more about her here. 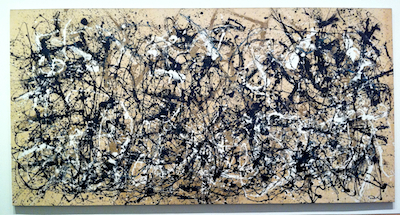 Pollock’s large paintings are really impressive. 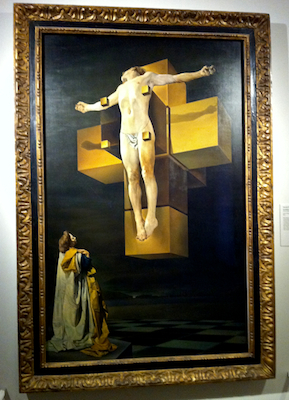 I’m sorry I didn’t write down the name of the artist who created this piece above. I believe his first name was Robert. 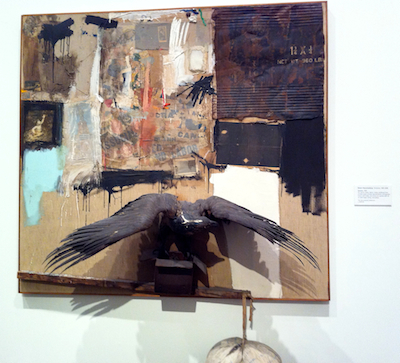 Yes, that is an eagle mounted to this mixed media piece. Which do you prefer? 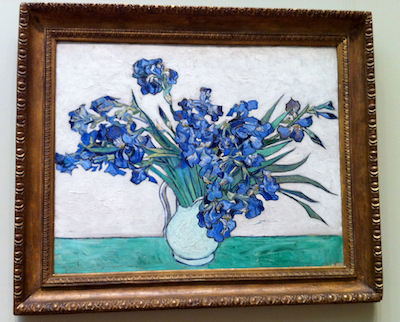 Monet’s Irises…. I like both of them. Each are unique interpretations of one of my favorite flowers. 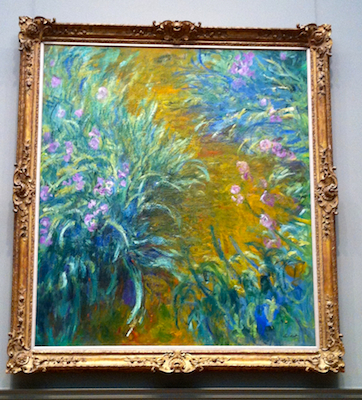 I do think, however, that I like Monet’s Irises better than his waterlilies. How is this for a mantelpiece? I believe it is from the Vanderbilt estate. The last room we visited had all this amazing Oceanic art. 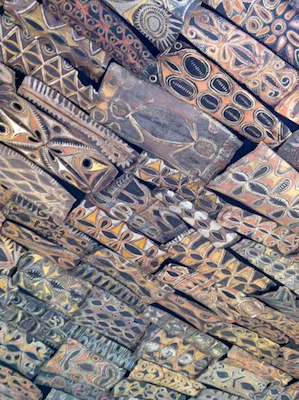 The ceiling tiles below were all created individually and then assembled to form the roof/ceiling of a home. The headdress above was worn in a certain ceremony. A male and a female headdress were typically used in the ceremony. The dancer wore the headdress for a very short period. And then the headdress was destroyed. This time we walked much further through Central Park and finally visited the area now known as Strawberry Fields. The Dakota rises over this area of Central Park. 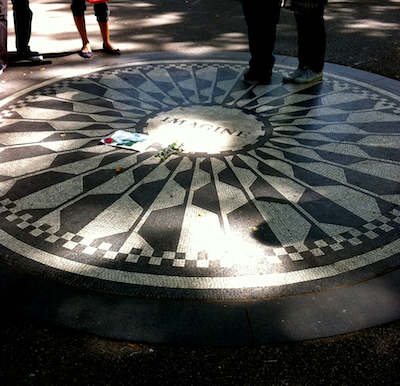 At the heart of Strawberry Fields is the Imagine medallion. As we sat on a bench watching people take pictures of each other on the Imagine medallion, I remembered being in Italy last year for our 25th anniversary. While staying in Venice we visited the Peggy Guggenheim Museum. In the museum’s sculpture garden was a “Peace” tree with little pieces of paper dangling from it. Next to the tree was a container with pencils and pieces of paper with strings attached. Visitors were asked to write their prayers and wishes on the paper and then to attach the paper to the tree branches. The Peace Tree installation was created by Yoko Ono. Sitting by the Imagine medallion, it felt like we’d come full circle. 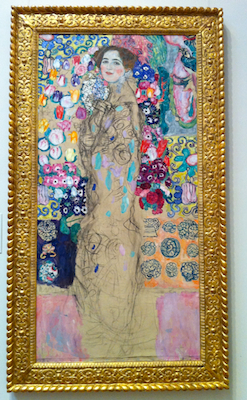 Categories: art, Inspiration, Museums, Vacation | Tags: art, Creativity, John Lennon, life, New York, The Met, Vacation | Permalink. 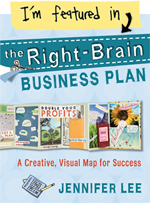 you have basic wisdom, basic intelligence, and basic goodness. tapping into what you already have. Categories: Inspiration, Philosophy, Quotes, Spirituality | Tags: Inspiration, Pema Chodron, Quotes, source, Spirituality, teachers, wisdom | Permalink.